This Bluetooth wireless shower speaker offers superior audio and easy pairing means to a wide range of Bluetooth audio devices. The water resistant casing and strong suction cap mean that you can enjoy the sounds and sing along in the shower no problem! You can of course also use this speaker system in the bath, or by the pool/on the beach for some holiday entertainment (it’s a very light and compact unit too, so easy to pack for a trip). If you use a smartphone for your music collection, then the TaoTronics speaker offers the ability to take incoming calls and use the built in microphone to chat without getting your smartphone wet. The silica suction cap will stick to almost any flat surface and the water resistant speaker has an IPx4 rating for water resistance. There are no wires or cables, plus no installation required, this Bluetooth shower speaker is simply ready to go as soon as you hit the pairing button and connect to your Bluetooth enabled device. The device looks great too with a high quality soft rubber feel – like a premium cars dashboard. There are useful LED indicators for charge and pairing status, plus audible status beeps. The bass is good but not particularly outstanding, while the forward facing speaker offers more treble than the typical rear facing speakers. The sucker attachment is especially good, somehow it manages to be secure while at the same time easy to remove! 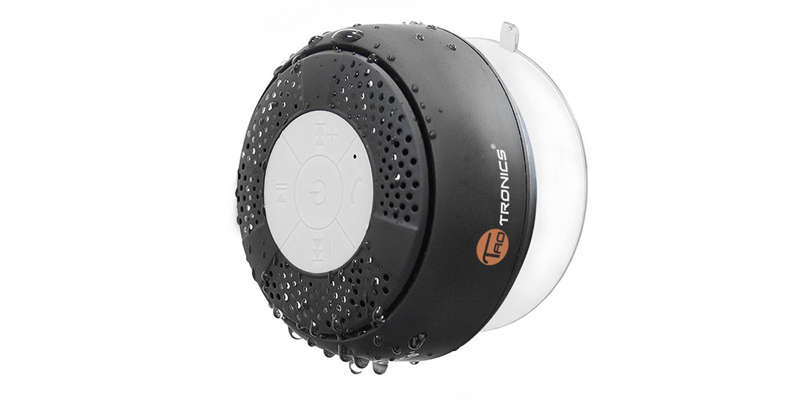 This waterproof speaker works great in the shower for music or as a hands free phone device. The instruction book is clear but hardly needed as most functions and controls are intuitive. Battery life is good at up to 6 hours of wireless music playback and the speaker will automatically revert to standby when not in use to preserve power. Be careful with the included cable however as it’s an unusual USB to round pin 5V design, rather than a standard mini USB connector – so don’t lose it or it will be expensive to replace!